At Tesla, Omar works in service. In the “before” mode of operation, cars arriving for service were assigned to one technician who then performed the service from start to finish. Now each car is assigned to a lead technician who assesses the work that needs to be done and estimates how many technicians can work on it in parallel, and a corresponding team joins the lead. The work is completed faster and the technicians spend less time waiting for jobs. This change in the organization of the work increased productivity with no robots and no technology. Genentech is a pharmaceutical company and, as Curtis explained, mandated to follow complex procedures when making any change to products or manufacturing processes. Their productivity improvement efforts have lately been focused on the acceleration of these procedures by making them more collaborative, mapping them and eliminating redundant checks. This, too, involves no robots and no new technology. 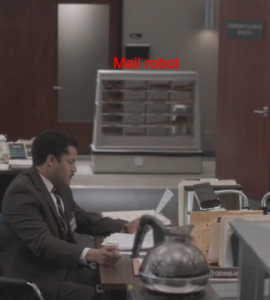 The FX show The Americans revived a piece of early 1980s technology that illustrates how introducing robots does not necessarily increase productivity: the mail robot. This contraption roamed the hallways and delivered paper mail to offices on its path. The notion that it would increase productivity is clearly ridiculous when you consider that you are replacing a cart with a human attendant with more expensive equipment and an engineering staff to program and maintain it. In the story, Soviet spies manage to bug it while it is in Maintenance and then get to transcribe hours of pointless office chit-chat every day. A massive increase in the productivity of mail operations would come a few years later, through email, not robots. Hospitals have often fallen into the automation trap. I once saw a hospital with a fancy robot that placed medications into bins for patients. I asked how much headcount was reduced by the robot. They weren’t happy with my question or the answer they had to give. Well, what about quality? Well, the robot would always pick the right medication… but only if the right medication was put into the right bag, which wasn’t guaranteed because of the role of humans in the process (or it just being a bad process). I’ve also seen dubious efforts to use automated “tuggers” to deliver supplies throughout a hospital… people sure love technology, even if it doesn’t really solve the problem or if it creates more problems than it solves. Recently, I planned and implemented automation that included a robot in a hospital sterile processing department and truly did discover a lot. Robot (shuttle) and automated systems intuitively loading and unloading in areas where repetitive push pull tasks are being performed makes sense. We had issues with the robot and automation at times, but issues were addressed and during the process the company that owns the robot and automation and my team members learned lessons. I found the keys to supporting automation and robot implementation work were being wise enough to start, educating users, putting sincere thought into the workflows impacted by this type of technology and also paying close attention to the problems and their solutions. Anytime I or my team thought something could be improved on future models from an engineering or design perspective we let the company know. I saw this as progress. From a project management perspective, we were successful. From a change and maintenance management perspective that’s where I found the weaker link. Organizations will need to map out the automation and robot support in new ways before implementation. The skill set to work with these systems also needs to be in place. Different questions need to be asked and understanding the answers will be necessary when planning a life with robots and automation. In some ways, sterile processing is a great place for this technology and a prime industry to discover what’s going to work and what will not work well. Surgical instrumentation itself and the space to store surgical instrumentation is limited in supply so meeting variable demand equates to constant work in progress. This forced us to learn lessons a little faster than we probably wanted to. Tuggers are being used to provide assistance to people and yes they be cumbersome at times. When these systems work they prevent back injuries. RFID systems are helping big organizations track and locate shared resources like available wheelchairs. I look forward to a time when robots can help deliver supplies. Medication robots could be more useful in the future if they can catch medication errors, send out alarms, track errors and provide reports. These types of robots will hopefully prevent harm to patients and help to change behaviors. As we continue to innovate we should be able to see that more time is given back to the human workforce so people can focus on all the details that improve quality and support excellence. The truth is the only way we’re going to appreciate the change that robots and automation can bring into the workforce is to start using them. It will take several iterations and failures before the full scope of benefit can be realized.